We have a revised article on Resistance and Resistivity and some information on state of the art ground penetrating radar technologies for corrosion investigation. I would also like to share a few images of our booth this year, where we were fortunate to launch the new Camur corrosion and cathodic protection monitoring and control systems. The resistance between an anode and cathode frequently controls the corrosion rate of reinforcement that has become corrosively active and is a key input into cathodic protection design. Mapping of concrete resistance can also indicate areas that are porous and/or wet which are important parameters in assessing corrosion risk. Whilst resistance is an important parameter until recently equipment has not developed to a very high level making on site measurements difficult. There was also a limited understanding of how to measure resistivity to give meaningful results and how to interpret resistivity measurements once obtained. This article reviews measuring resistivity with Proceq’s Resipod and measuring resistance with Force’s Corromap. 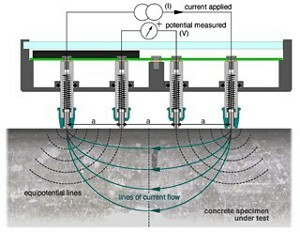 Resistance measurement between a connection to the reinforcing cage and an external point on a concrete structure is taken with Force’s Corromap. It provides a quick and reliable method of mapping variations in resistance. Because resistance is a function of distance from the bar as well as the concrete resistance results are more meaningful if the point of measurement has a constant position in relation to the reinforcement grid, e.g. directly over a bar. Even then it doesn’t provide a good measure of resistivity but it can indicate areas of wetness or porosity and help to indicate areas where corrosion rates would be high. Resistivity differs from resistance in that it is a measurement per unit of volume and therefore independent of size effects. The 4 point Wenner probe is the common way of measuring insitu concrete resistivity but suffered in the past from lack of calibration and poor assurance of good contact during measurement. These issues have largely been overcome using Proceq’s Resipod. Resistivity or conductivity is strongly affected by water content of the concrete as well as the chloride content. Resistivities are so sensitive to water content in the concrete that it can be difficult to interpret the result in terms of long term performance. Resistivities may be low one day after rain and high a couple of weeks later when the concrete has dried out. The following procedure is recommended by the author for taking resistivity measurements in the field using a 4 point Wenner Probe. Take one measurement with minimal “wetting”. Note the weather conditions and the how moist the concrete appears. This is the ambient reading and can be used as long as the ambient conditions are taken into account during interpretation. Wet the surface of the concrete down periodically for an hour until virtually saturated and take another measurement. This reading is the worst case scenario in regards resistance controlled corrosion rate. It also tells us something about the concrete. Saturated resistivities in the 3000-10000 ohm cm range indicate a GP cement was used. Saturated resistivities over 15,000 ohm cm indicate an SCM was used. A great leap forward in surface resistivity measurement is the Resipod by Proceq. Traditionally many users have drilled contact holes for the four probes of the Wenner array to allow a decent contact. The Resipod uses a probe with many capillaries within it which draw water into the probes which is released when the probe is held on the concrete and reduces the contact resistance to an insignificant level. Secondly the Resipod has the ability to automatically vary the current being used to perform the measurement. Where a material has a very high resistivity the current is automatically increased and hence resistivities up to 1000 kΩcm can be measured. Resipod tests on compressive cylinders makes testing low cost meaning the test can easily be specified as a frequent QA test. It has also been shown that resistivity is directly related to chloride diffusion through the Nernst Einstein equation but a simple standard calculation has yet to be agreed. Ground Penetrating Radar [GPR] is at its best when used to examine the geometry of concrete and embedments. Corrosion investigation in concrete is primarily performed using electrochemical methods which are dependent upon the electrical activity corrosion creates. This article will examine how GPR can be used as an adjunct to conventional Corrosion investigation and also explore recent developments in automated analysis of GPR data from IDS. The first and best protection for rebar against corrosion is good quality concrete with no damage and sufficient cover. In order for corrosion in concrete to progress sufficient oxygen and water must be present around the reinforcing and the passive coating formed on the steel rebar due to the highly alkaline nature of concrete pore water must be damaged by chloride ingress, or through diffusion of carbon dioxide from the air. The greater the concrete cover, the longer diffusion processes will take and with no cracks running to rebar level there is no accelerated ingress path. GPR is an efficient method for cover measurement. Standard GPR B Scan output like that shown at left can be used to measure cover depth. To do so the speed at which radar waves are travelling through the concrete must be measured, possible through physical confirmation of thickness, conservative estimation or a process known as curve fitting. The red line visible at right demonstrates curve fitting, the red line is varied until it precisely overlap the hyperbola formed by the reinforcing and this provides a measurement of the propagation velocity. The image below illustrates automatic cover measurement by IDS Gred HD3. The system performs the curve fitting process on data collected with IDS’ HI-Bright and then automatically picks the peaks of the top reinforcing mat, visible as the red line. Where asphalt is present (for example on a bridge deck slab), the asphalt is layer is handpicked by the user and removed from the cover thickness calculation. 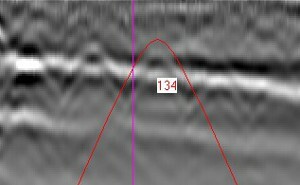 In the B-Scan below there is no asphalt and so the green line “asphalt layer” is on top of the scan. The speed at which radar waves move through concrete is dependant primarily on the dielectric constant ,the larger the dielectric the slower the propagation velocity, which is also a major contributor to the attenuation experienced by the wave. Concrete as a material has solid, liquid and gas components. Solids form the bulk of the material while liquids which are primarily highly saline water form only a small percentage. The dielectric constant of the solids is an order of magnitude smaller than the liquid phase. This means that a small change in the volume water will result in a comparatively large increase of the total dielectric constant. The image above is a Gred HD3 visualisation of propagation velocity, which can be used as a good measure of relative moisture content and as one indicator of regions where corrosion is possible. The Blue signals are lower velocity, higher dielectric, which corresponds to higher moisture. The final map that is offered by Gred HD3 is a map of signal strength. This is a measure of how much signal is reflected at the rebar level, if there is a large volume of corrosion product this will reduce power, as will water content. When this data is viewed and compared with the dielectric/moisture maps it will further highlight areas for investigation where there may be proceeding corrosion. Blue areas on the image below are low strength, we can see around X 5 Y 4.5 a light blue area which corresponds well with a similarly shaped patch on the velocity map. Future development in GPR tests which can indicate corrosion activity may include examining of the spectra of returning GPR signals, further automation of existing methods and more advanced image processing such as the use of synthetic aperture scanning to resolve clearer, easier to interpret images. GPR offers many opportunities for corrosion engineers, cover surveys during commissioning can be used to better model service lives and where it is possible to collect large data sets such as with the Hi-Bright processing for moisture and heavy corrosion is possible. GPR cannot replace conventional electrochemical methods, but can work well in support or as a means to investigate large areas. Our Brisbane Office is now Open! Troy Zhong has joined PCTE to spin up our new Brisbane office, his valuable experience as an Electrical Engineer will continue to improve PCTE’s knowledge base and he is now the first point of contact for QLD inquiries. PCTE’s library of training and information videos continues to increase in scope and volume, we have recently launched a training video for Olson Instruments CTG, and for those closely watching our YouTube channel they can see a quick introduction of Corrosion in Concrete we made for one of our customers. PCTE are pleased to launch the Camur system. The Camur II system is created for permanent and automatic monitoring of corrosion in concrete, with data retrieval and control features through phone line, mobile phone or internet. It can connect with a wide range of corrosion monitoring electrodes and CL probes, including force’s ERE20 electrodes. The system may also be used to monitor and control Cathodic Protection. With William Ward’s completion of Olson Instruments NDE Training Seminar and one on one training PCTE now has two staff with expert knowledge on a range of frequency based testing methods. The course focused upon their NDE 360 and freedom data PC systems and looked at Geophysical, construction and foundation testing methods.